The ferocious saber-toothed cat Smilodon was a star in Hollywood long before it became Tinseltown, with extensive remains of this Ice Age predator that prowled North and South America preserved in the La Brea Tar Pits in Los Angeles. "If you think about it, Smilodon fatalis likely left their paw prints on what is today Hollywood Boulevard long before Marilyn Monroe left her hand prints at the Chinese Theater," said paleontologist Z. Jack Tseng of the American Museum of Natural History in New York. Scientists last week offered unique insight into the big cat's most famous feature: its dagger-like upper canine teeth. Using sophisticated X-ray imaging and an analysis of oxygen isotopes in the cat's tooth enamel, they determined that its canines grew at twice the rate of those in today's African lions and that the Smilodon was at least three years old before its canines were fully in place. A partially fossilized jaw from an adult Smilodon fatalis saber-toothed cat showing a fully erupted canine is pictured in this undated handout photo courtesy of the American Museum of Natural History, July 1, 2015. These curved and serrated canines, reaching seven inches (18 cm) long, were quite a weapon. Smilodon is believed to have used them to bite the neck and sever crucial arteries and veins to kill prey quickly, paleontologist Robert Feranec of the New York State Museum said. Smilodon was about the size of a modern lion or tiger but more heavily built, with a stiffer back, powerful limbs and a stubby tail, "basically a lion on steroids with knives coming out of its mouth," Tseng said. It went extinct about 10,000 years ago, Feranec said. The study looked at Smilodon fatalis, one of three species of this cat, using remains from the La Brea Tar Pits, a treasure trove of Ice Age fossils including mammoths, mastodons, wolves, ground sloths, bison and camels. Smilodon was drawn to the Tar Pits to feed on large prey trapped in the gooey asphalt seeps, and then also got stuck. 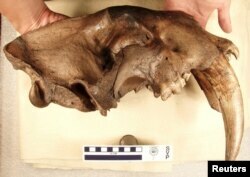 Smilodon grew a set of baby teeth before permanent ones grew in. Its "baby sabers" were shed at around one to one-and-a-half years of age. The adult sabers, beginning to erupt before the baby ones were shed, finished coming in at approximately three to three-and-one-half years of age, Tseng said. The growth rate of Smilodon's permanent canines, which were three times bigger than those of a lion, was found to be about a quarter inch (six mm) per month. The research was published in the scientific journal PLOS ONE.